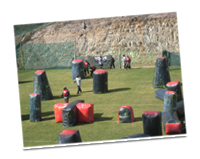 Today was the first day of play at Samford Skirmish which hosts Round 3 of the Super 7 Series aka South Pacs 2007, one of the longest running and most competitive paintball tournaments in Australia. Team numbers were lower this year with only 19 competing, down from 26 teams last year. I didn't compete with Paint Savvy this year, as I'd been traveling, instead, I was there under the guise of ITM Productions and as Official PBDB Photographer, along with the aid of ace flickr-photographer, Mojodale.